As a child in the 1960s, Emma Mitts and some of her 15 siblings would often hide their shoes in the road as they walked to school on rainy mornings in Elaine, Ark. They couldn’t afford new pairs if the ones they had broke during the long, muddy walk. Mitts, the daughter of a farmer, then looked up to the ceiling of her West Side aldermanic office as she recalled the memory. A young Mitts — now 59 — wouldn’t know then that she’d move to Chicago and work several jobs before being appointed alderman of the 37th Ward. She wouldn’t know that she’d keep that seat for 15 years without facing a real threat of losing her spot – until now. Since Mitts became alderman in 2000, she’s received at least 58 percent of the vote in the 2003, 2007 and 2011 elections. But in the Feb. 24th election, she was just shy of the 50.1 percent needed to win outright and now faces her first runoff race against CPS teacher Tara Stamps. Mitts reports receiving nearly $160,000 in campaign funds, according to state election records. That’s less than Stamps’ $221,000, but the alderman can also tally up an additional $52,000 on campaign mailers and ads paid for by Chicago Forward, a political action committee aligned with Mayor Rahm Emanuel. Chicago Forward’s support doesn’t help Mitts rebut the repeated criticism that she’s been a rubber stamp for Emanuel, facing a runoff himself. Her opponent often cites a University of Illinois at Chicago study that shows Mitts voted with the mayor 97 percent of the time between 2011 and 2014. She also made anti-gay remarks caught on video at a candidates forum in March, asking why gay couples should get the same tax benefits as a heterosexual pair. These comments helped her attract negative attention in the critical days leading up to the April 7th runoff election. The stumbles don’t seem to have fazed Mitts. She has apologized for her remarks at the forum – and received a vote of support from Ald. Tom Tunney (44th), an openly gay alderman who said she’s voted in line with several LGBT issues in the Chicago City Council. She then issued a statement saying she’s not anti-gay. The alderman’s daughter, 37-year-old Latonya Mitts, chalked up the comments to her mom being overwhelmed at the debate. “That’s not her heart, that’s not her spirit,” her daughter said. “She loves everyone. Ald. Mitts told AustinTalks last week she’s not anti-union either but made her election-night comments because she was frustrated over how she has been treated by the CTU, a major Stamps backer. She suspects it might be because of her support of charter schools. “I am a target for (CTU),” Mitts said. And despite the criticism, Mitts said she feels good about winning because she understands the community and has brought positive change to the ward. The alderman first came to Chicago in 1975 on break from college in Pine Bluff, Ark. She no longer had the money to finance college, and after she got a job at a McDonalds, she decided to stay. Mitts worked at McDonalds and did other odd jobs for 14 years before she was hired at the city’s finance department as a parking meter aide in 1989. In 1995, Mitts was hired in accounting at the Department of Streets and Sanitation, then landed a job as special projects coordinator for the department’s street operations division in 1998. The door to City Hall’s fifth floor opened when former 37th Ward alderman Percy Giles was convicted in 1999 of receiving bribes from a federal mole. Mitt claims she had no contact with then-Mayor Richard M. Daley when he called her into his office to discuss the aldermanic spot. She said she was suggested to him by community organizations who recognized her work as block club president and a 15th District CAPS beat facilitator. She was appointed in 2000. Since then, Mitts – who is the chairwoman of the License and Consumer Protection Committee – became perhaps best known for bringing the first Wal-Mart to Chicago, something she repeatedly mentions when asked about what she’s accomplished during her 15 years in the council. She and Daley’s successor, Mayor Emanuel, have both touted bringing 200 jobs to the Freedman Seating company at 4545 W. Augusta Blvd. The president of that company, Craig Freedman, donated $5,000 to Mitts’ campaign, according to Secretary of State and state campaign finance records. She received another $5,000 from donor “Gerald Freedman Trustee” at the same address as Freedman Seating. The Chicago For Rahm committee recently gave $10,000 to Mitts’ campaign; Mitts’ ties to the mayor has been something her opponent has tried to capitalize on. In a recent debate, Stamps pointed out that Mitts had voted with the mayor’s proposal to close six mental health clinics across Chicago in 2012, even though she touted speaking out against the matter. Mitts said in a later interview that she felt overwhelmed by the ordinance’s supporters and thought her ideas could be misplaced if she was so outnumbered. When asked if there were any ordinances Mitts voted against or proposed that did not have the mayor’s backing, she said she “couldn’t recall at the moment.” She said the same thing when AustinTalks asked her that question on election night. Maretta Brown-Miller, who ran her second unsuccessful campaign against Mitts this year, endorsed the alderman last month. She had previously criticized Mitts for being out of touch with the community, citing a resident she Brown-Miller met who didn’t know who their alderman was. Now, after sitting down with Mitts, Brown-Miller said communication is a two-way street, and residents have the responsibility to seek out information, too. She added Mitts was grieving the deaths of her mother and brother two years ago, which the alderman has said caused her to step back from community engagement. “She knows where the downfall of some things were, and she knows she’s gotta get back out there,” Brown-Miller said. Questions about how connected she’s been to the community were raised in 2013 when a charter school was proposed for the lot across the street from Charles Allen Prosser Career Academy, a neighborhood school, at 2148 N. Long. At one point, 700 residents signed a petition opposing the Noble charter school. The proposal for a new charter gained steam just a few months after 50 schools were closed across the city. None were closed in the in the 37th Ward, something even Stamps gives Mitts credit for. Mitts said she supported the charter because Prosser was overcrowded and residents needed a new option. That’s the response she gave about another charter school in her ward, Horizon Science Academy, which is now under federal investigation. In a recent interview, Mitts said she supports charter schools because a lot of her residents want a choice of where they can send their children. “When you try to do good, people don’t always agree with you,” Mitts said. There is nothing significant in Mitts’ record about public safety, but she said she wants to create better relationships between residents and police, citing last summer’s killing of 18-year-old Michael Brown in Ferguson, Missouri, as a catalyst. If reelected, Mitts said she wants to open a youth center to the ward, and hopes to continue spurring economic development that will bring more jobs to the West Side. Those are reasons the alderman said she keeps running – because there’s still more she wants to do. Through more tears, Mitts asserted she cares more than anyone about her residents. Chicago Police Sgt. 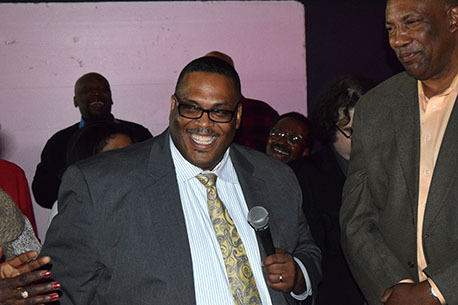 Chris Taliaferro will succeed Ald. Deborah Graham in May. No longer will Austin students have to leave the West Side to continue or start their IB education at the high school level. Michele Clark High School will receive $200,000 in next year's budget to begin implementing the rigorous program offered in more than 146 countries.